Why are investors rushing back into safe-haven Treasuries? Maybe the crowd’s recognizing that political risk for the US is higher than previously assumed. Or perhaps the softer estimates for first-quarter GDP growth are weighing on sentiment. A highly valued stock market doesn’t help. 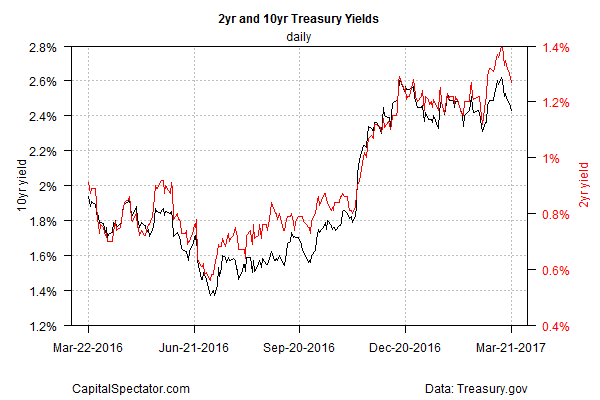 Whatever the reason, Treasuries are everyone’s new best friend… again. The yield on the benchmark 10-year Note fell to 2.43% on Tuesday (Mar. 21), a three-week low, based on daily data via Treasury.gov. Routine noise? Perhaps, except that the yield has dropped after the Federal Reserve raised interest rates last week and hinted that monetary tightening would continue in the months ahead courtesy of stable if not accelerating economic growth. The Treasury market, however, seems inclined to embrace an alternative narrative. 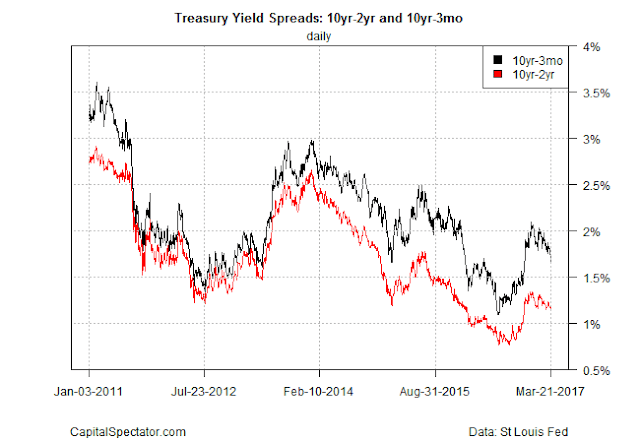 Consider the narrowing of Treasury spreads, which implies that investors are becoming increasingly anxious on the margins about the economic and/or political outlook. In fact, the slide in spreads is old news. The 10-year/3-month spread, for example, has been falling for more than four months, dipping to 1.66% yesterday – the lowest since Nov. 9, the day after Donald Trump’s election victory. Speaking of Trump, it’s reasonable to wonder if the honeymoon is over. The stock market’s been trending higher on expectations that a wave of pro-business policy and legislative changes will materially lift US economic growth. In the wake of yesterday’s selloff in equities, however, Mr. Market appears to be adopting a slightly more conservative reading of the future. Indeed, the only thing that the Trump administration has delivered so far is a treasure trove of political drama for journalists. That doesn’t mean that the White House’s agenda is dead. But there’s a growing awareness in the markets that success in Washington isn’t guaranteed and will require more than a fusillade of tweets. There’s also a realization that political risk associated with the Trump administration is anything but trivial. The President may be successful in the end, but at the moment it’s hard to see the logic on how becoming embroiled in numerous political storms, some of which are self-inflicted, is the basis for triumph.